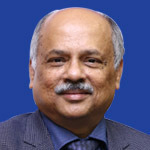 Raja Natarajan is Deputy Managing Director at SAGE India. He has over 30 years of work experience of financial functions across a diverse range of industries and functions, both in products and services, in India and abroad, varying from Indian Oil (Petroleum and Energy) to Hyderabad Industries (Building Products) to Marico (FMCG) to Ariba (Procurement Specialists using Technology) to Subhiksha (Retail) to TNS (Global Market Research company) and now SAGE. He is a people's person and a strong believer of value systems. He is multi-lingual and can read and write in English, Hindi, Bengali, Tamil, Assamese and French.